Welcome to another great episode of #ThatBusinessShow with your host, Jamie Meloni! Remember, the show airs every day at 8am on #1250whnz and on http://www.tampabayradio.com! We’re very excited, as the 2 year anniversary of being on #MorningAir is approaching on September 13th! Jamie began this show as a hobby, and now we’ve had hundreds of guests and shows, and created this huge network of professionals to share business and stories and its become quite the valuable resource. You can access this network on http://www.tampabayradio.com on the past guests tab. 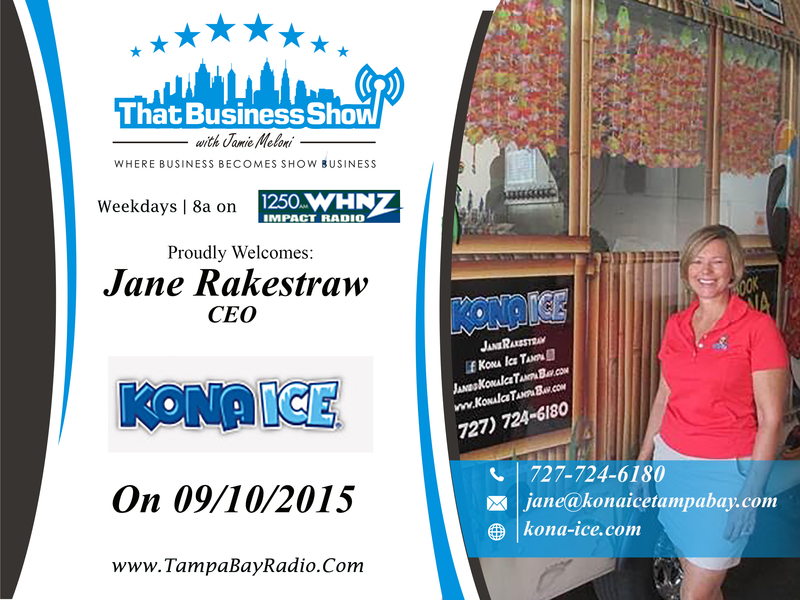 Today on the show we welcomed Jane Rakestraw, CEO of fun with Kona Ice Tampa Bay. Additionally we welcomed Matt DiGennaro, Founder and CEO of Seabridge Wealth Management. Great content on this episode of #ThatBusinessShow, as we had tips on your investment portfolio and a possible fundraising contact, and that’s what this show is all about, having a diverse guest list to come on and showcase their success! If you’re interested in coming on, head to http://www.tampabayradio.com and leave Jamie a message! Featuring on our first segment was Jane Rakestraw, CEO of Fun of Kona Ice Tampa Bay. She invested in Kona Ice in 2013, and since then has donated over $125,000 to the Tampa Bay and surrounding community! She continues Kona Ices’ tradition of giving back to the community, with nationwide donations reaching more than 27 million dollars! Kona Ice isn’t your traditional shaved ice proprietor, as it goes mobile, bringing the fun and even nutritious treat to you! Jane spoke to us on how she invested nearly $100,000 in her trucks, and they have seen quite the return, as they are often fully booked, going to fundraisers, schools,games, and even workplaces – bringing joy to the people they serve with tropical music and vitamin infused ice treats! To learn more about Kona Ice of Tampa Bay and to book your next event, contact Jane Rakestraw by email at jane@konaicetampabay.com or by phone at 727-724-6180. 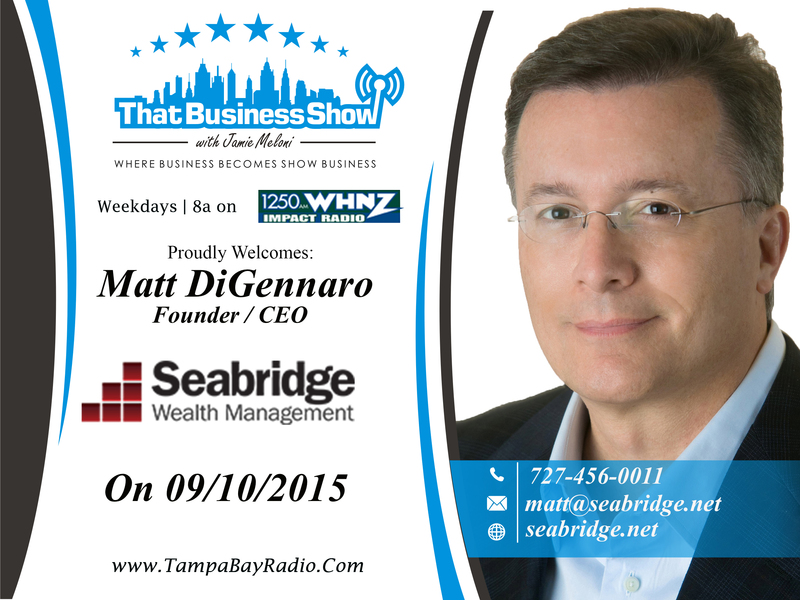 On our last segment we featured Matt DiGennaro, Founder and CEO of Seabridge Wealth Management. Matt and Jamie discussed his background, with over 25 years on Wall Street in the securities and asset management business. He was in the global market, and has expertise learned form being the Managing Director and Head of Bank of America’s $38 billion asset management division for Europe, Middle East, Africa, Asia and Latin America. Conducting business in over 45 countries, he is quite the experienced and professional asset manager. Matt and Jamie touched on what makes Seabridge Wealth Management different, working for the client instead of the commission, being a “fee only” asset management company, meaning in a nutshell that they don’t have any hidden agendas to work for the commission like other brokers. Working for the best of the client, Seabridge Wealth Management has experts that work to diversify their client’s portfolio, rather than to predict which market is going to be the “hottest” this quarter. He had discussed a great set of tips and information on the show, and that’s insight that only listeners of #ThatBusinessShow will hear! Catch the show ever morning at 8am on #1250whnz or head to http://www.tampabayradio.com! To learn more about Matt DiGennaro and Seabridge Wealth Management, head to their website at http://www.seabridge.net! This entry was posted in Articles, Entrepreneurship and Business and tagged business, entrepreneur, radio, show business, talk, work. Bookmark the permalink.